CTL play a major role in the clearance of respiratory syncytial virus (RSV) during experimental pulmonary infection. The fusion (F) glycoprotein of RSV is a protective Ag that elicits CTL and Ab response against RSV infection in BALB/c mice. We used the strategy of screening a panel of overlapping synthetic peptides corresponding to the RSV F protein and identified an immunodominant H-2Kd-restricted epitope (F85–93; KYKNAVTEL) recognized by CD8+ T cells from BALB/c mice. We enumerated the F-specific CD8+ T cell response in the lungs of infected mice by flow cytometry using tetramer staining and intracellular cytokine synthesis. During primary infection, F85–93-specific effector CD8+ T cells constitute ∼4.8% of pulmonary CD8+ T cells at the peak of the primary response (day 8), whereas matrix 2-specific CD8+ T cells constituted ∼50% of the responding CD8+ T cell population in the lungs. When RSV F-immune mice undergo a challenge RSV infection, the F-specific CD8+ T cell response is accelerated and dominates, whereas the primary response to the matrix 2 epitope in the lungs is reduced by ∼20-fold. In addition, we found that activated F-specific effector CD8+ T cells isolated from the lungs of RSV-infected mice exhibited a lower than expected frequency of IFN-γ-producing CD8+ T cells and were significantly impaired in ex vivo cytolytic activity compared with competent F-specific effector CD8+ T cells generated in vitro. The significance of these results for the regulation of the CD8+ T cell response to RSV is discussed. Respiratory syncytial virus (RSV),4 a member of the Pneumovirus genus of the Paramyxoviridae family, is the leading cause of severe lower respiratory tract infection in infants (1). RSV is also an important cause of symptomatic debilitating respiratory tract infections in the elderly population (2). RSV-specific CD8+ T cell responses are involved in the clearance of the virus and recovery from infection. In BALB/c mice, previous studies have demonstrated that virus-specific CTL are sufficient for effective virus clearance during primary infection (3, 4) and matrix 2 (M2), fusion (F), and N proteins of RSV are major target Ags for MHC class I-restricted CTL activity (5, 6, 7). In humans, RSV-specific CTL develop in response to natural infection (8, 9), and F and N proteins are reported to be primary targets for MHC class I-restricted CTL responses (6, 10, 11). In addition to the role in the clearance of virus, it has been suggested that CD8+ T cells play an important role in the regulation of the differentiation and activation of Th2 CD4+ T cells, which mediate the enhanced lung pathology by the recruitment of eosinophils into the lungs during RSV infection (12, 13). It has also been hypothesized that CD8+ CTL play a role in the pathogenesis of RSV-induced disease. For example, enhanced pulmonary injury was reported in a mouse model of RSV infection in which passive transfer of activated RSV-specific CTL resulted in rapid virus clearance from the lungs but also enhanced pulmonary pathology (3). The immune mechanisms underlying the balance among protection, disease, and recovery from infection is still unclear. The advent of methods such as MHC class I tetramer and peptide-induced intracellular cytokine staining (ICS) has provided the opportunity to detect and accurately enumerate Ag-specific CTL and to analyze the kinetics of the virus-specific CTL response at the site of infection during the time course of infection. Therefore, the identification of CTL epitopes of RSV and the subsequent application of new technologies may contribute to elucidating the role of CD8+ CTLs in RSV immunity and pathogenesis. Although the CD8+ T cell response to the M2 is directed primarily if not exclusively to a single immunodominant site spanning residues 82–90 of the M2 protein (14), no corresponding site recognized by CD8+ T cells has been identified in the RSV F protein. In this study, we have identified an immunodominant CTL epitope contained in RSV F protein and have shown that it is Kd-restricted. Using MHC class I tetramer containing this epitope, we visualized and quantitated F-specific CD8+ T cell response during primary and secondary RSV infection of BALB/c mice. We found that the magnitude of F-specific CD8+ T cell response during primary RSV infection is 10-fold lower than the dominant M2-specific response. In contrast, this response hierarchy is reversed in challenge infection of F-primed mice, with a 20-fold suppression of the M2-specific primary CTL response in the lungs. These results established a immunodominance hierarchy between F- and M2-specific CD8+ T cell responses in experimental RSV infection. In addition, functional assays measuring the effector activity of lung CD8+ CTL revealed the defective phenotype of effector functions by these F-specific CD8+ T cells, suggesting that RSV induces immune dysregulation of virus-specific CD8+ T cells. The significance of these results for CD8+ T cell epitope immunodominance and for the host response to RSV infection is discussed. Female BALB/c mice (H-2d), 6–8 wk old, were purchased from Taconic Farms (Germantown, NY). Mice were housed in a pathogen-free environment. The A2 strain of RSV was a gift from P. L. Collins (National Institutes of Health, Bethesda, MD). RSV (A2 strain) stock was grown on HEp-2 cells (American Type Culture Collection, Manassas, VA) and titered for infectivity. Recombinant vaccinia virus expressing the F protein of RSV (vvF) was a gift from J. L. Beeler (National Institutes of Health). Mice were infected with 5 × 106 PFU vvF by scarification at the base of the tail. Three weeks after priming, mice were lightly anesthetized with ether-chloroform (2:1), and inoculated intranasally with 1 × 106 PFU RSV in 50 μl. At various times after infection, infected mice were sacrificed by cervical dislocation. Synthetic peptides were made by standard 9-fluorenylmethoxycarbonyl chemistry with a model AMS422 peptide synthesizer (Gilson, Middleton, WI). RMA-S expressing Kd or Ld molecules cells were maintained in selective medium (RPMI 1640 supplemented with 10% FBS, 10 U/ml penicillin G, 10 μg/ml streptomycin sulfate, 2 mM l-glutamine, 5 × 10−5 2-ME, 1 mM sodium pyruvate, 0.1 mM nonessential amino acids, 10 mM HEPES, and 200 μg/ml G-418 (Life Technologies, Gaithersburg, MD)). Cells were incubated at 25°C in a 5% CO2 atmosphere for 3 h, pulsed with indicated amounts of peptides, and then warmed to 37°C for an additional 3 h. Cells were then stained with PE-conjugated anti-Kd mAb (clone SF1-1.1; PharMingen, San Diego, CA), or anti-Ld mAb (clone 28.14.8) followed by FITC-conjugated goat anti-mouse IgG (Caltag Laboratories, San Francisco, CA), washed twice, and analyzed by flow cytometry. All staining manipulations were conducted at 4°C. The lungs were perfused with 5 ml PBS containing 10 U/ml heparin (Sigma, St. Louis, MO) through the right ventricle using a syringe fitted with a 25-gauge needle. The lungs were removed and placed into complete IMDM (supplemented with 10% FBS, 10 U/ml penicillin G, 10 μg/ml streptomycin sulfate, 2 mM l-glutamine, 5 × 10−5 2-ME, 1 mM sodium pyruvate, 0.1 mM nonessential amino acids, and 10 mM HEPES). The tissue was processed through a steel screen to obtain a single-cell suspension, and particulate matter was removed by quick centrifugation at 300 × g. Cells were counted and resuspended at the given cell concentrations for the appropriate in vitro assay. Pooled spleen cells from vvF-immunized mice were resuspended in complete IMDM supplemented with recombinant human IL-2 (20 U/ml), and 2.5 × 107 cells were added to each well of a six-well plate. Syngeneic splenocyte stimulators were prepared from naive mice by irradiation (2000 rad) and pulsing for 0.5 h at room temperature with the peptide at a concentration of 5 × 10−8 M. Thereafter, cells were extensively washed to remove free unbound peptide, and 5 × 106 cells were added to the each well of responder cells. MHC class I-peptide tetramers were produced as described previously (15). Plasmid DNA encoding the extracellular domain of the H-2Kd H chain and human β2-microglobulin were provided by J. Altman (Emory University, Atlanta, GA) and E. Pamer (Yale University, New Haven, CT), respectively. Recombinant proteins were expressed in Escherichia coli, purified from inclusion bodies, solubilized, and refolded in the presence of corresponding peptides. Folded complexes consisting of H-2Kd, β2-microglobulin, and antigenic peptide were purified by gel filtration over a Sephacryl S-300HR column (Amersham Pharmacia Biotech, Piscataway, NJ) and enzymatically biotinylated with the biotin-protein ligase BirA (Avidity, Denver, CO). The biotinylated monomer complexes were further purified over a Mono-Q ion exchange column (Amersham Pharmacia Biotech) and tetramerized with PE-labeled streptavidin (Molecular Probes, Eugene, OR). Tetramers were stored at 5 mg/ml at 4°C in PBS (pH 8.0) containing 0.02% sodium azide, 1 μg/ml pepstatin, 1 μg/ml leupeptin, and 0.5 mM EDTA. Freshly explanted lung lymphocytes were purified by density gradient centrifugation and stained in PBS, 3% (w/v) FCS, 0.09% (w/v) NaN3 using fluorochrome-conjugated Abs and MHC class I tetramers. The Abs used were anti-CD8α (clone 53-6.7), anti-CD11a (clone 2D7), anti-CD25 (clone 7D4), anti-CD43 (clone 1B11), and anti-CD62L (clone MEL-14). All Abs were purchased from PharMingen. After staining, cells were fixed in PBS, 2% (w/v) paraformaldehyde, and events acquired using a FACSCalibur flow cytometer (BD Biosciences, San Jose, CA). Dead cells were excluded on the basis of forward and side light scatter. Data were analyzed using CellQuest software (BD Biosciences). To enumerate the number of IFN-γ-producing cells, intracellular cytokine staining was performed as previously described (16). In brief, 106 freshly explanted lung lymphocytes were cultured in a culture tube. Cells were left untreated or stimulated with F85–93 peptide (1 μM) and were incubated for 5 h at 37°C in 7% CO2. Brefeldin A (10 μg/ml; Sigma) was added for the duration of the culture period to facilitate intracellular cytokine accumulation. After this period, cell surface staining was performed as above, followed by intracellular cytokine staining using the staining buffer containing 0.5% (w/v) saponin (Sigma). The Abs used were anti-IFN-γ (clone XMG1.2) or its control isotype Ab (rat IgG1). Standard chromium release assay was performed as described (13). Briefly, 5 × 103 sodium [51Cr]chromate-labeled P815 cells were added as target cells per well of U-bottom 96-well plates (Costa, Cambridge, MA) and tested for lysis by effector cells in the presence of relevant or irrelevant peptide. Effectors from lung-derived lymphocytes or in vitro-cultured splenocytes were prepared by density gradient centrifugation and CD8+ T cells were subsequently enriched by positive selection using MACS (Miltenyi Biotec, Auburn, CA). Typical purification results in 80–90% CD8+ cell purity. Percent specific lysis was calculated as ((51Cr release with effector cells − spontaneous 51Cr release)/(total 51Cr release with 1% Triton X-100 − spontaneous 51Cr release)) × 100. Spontaneous 51Cr release from target cells in all assays was <5% of the detergent lysis. The percent specific lysis values represent the mean values of quadruplicate wells. To identify potential CTL epitopes within F protein, we synthesized an overlapping panel of 15-mer synthetic peptides spanning the 574-aa F protein of the RSV A2 strain and tested these peptides for a target cell sensitization in CTL assays. Effector cells used in the screening were derived from the spleens of BALB/c mice that had been primed with vvF, stimulated in vitro with RSV-infected APC, and tested on P815 target cells pulsed with overlapping peptides in standard 51Cr release assay. We have previously shown that this priming and in vitro stimulation strategy leads to robust in vitro secondary CTL activity by immune splenocytes in response to RSV-infected APC (13). 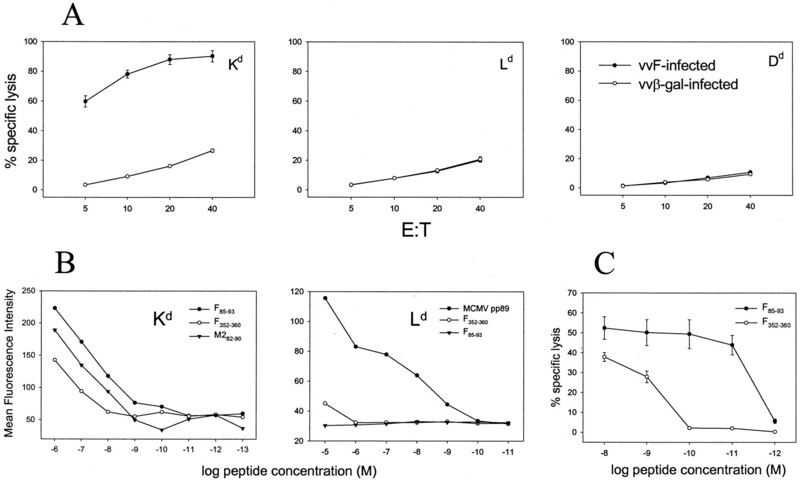 In this initial screening, two peptides were identified that exhibited lytic activity above background killing with irrelevant peptide (data not shown). One peptide included residues 85–93 of the F glycoprotein, which contains a canonical H-2Kd-binding motif (KYKNAVTEL; critical anchor residues are in bold) and the other peptide included F residues 352–360, which contain an H-2Ld-binding motif, i.e., FPQAETCKV. We then synthesized the two nonamer peptides, F85–93 and F352–360, conforming to the predicted motifs and containing the putative CTL target sequences, and tested the ability of these peptides to sensitize target cells for recognition by RSV F-specific CTL generated in vitro. Target cells sensitized with F85–93 or F352–360 peptide were lysed by immune CD8+ T cell effectors generated in vitro from the spleen of vvF-immunized but not vvM2-immune mice (data not shown). To determine whether these peptides corresponded to valid Kd- and Ld-restricted F epitopes, we first examined the ability of in vitro generated CTL from vvF-primed mice to recognize L929 (H-2k) cells stably expressing the transfected Kd, Ld or Dd MHC class I genes, respectively. Because L cells are not productively infected with RSV, the targets were infected with vvF to express the endogenously processed F glycoprotein. Control target cells were infected with vaccinia virus expressing β-galactosidase. As Fig. 1⇓A demonstrates, F-specific CTL lysed vvF-infected L cells expressing the Kd molecule but not the Ld or Dd transfectants. Identification of a CTL epitope in RSV F protein. A, H-2d restriction of RSV F-specific CTL activity was determined by standard CTL assay using vvF-infected L cells stably expressing Kd, Ld, or Dd H-2 molecules as target cells. Effectors were obtained from pooled splenocytes of vvF-immunized mice that had been stimulated for 6 days with RSV-infected APC. B, Increased levels of H-2Kd MHC class I protein expression by F85–93 and F352–360 peptides. The RMA-S cells expressing Kd or Ld molecules were pulsed with 10-fold dilutions of peptides for 3 h at 37°C before staining with anti-Kd or anti-Ld mAb. RSV M282–90 SYIGSINNI peptide and murine CMV pp89 YPHFMPTNL peptide were used as positive controls for Kd and Ld binding, respectively. C, Level of CTL activity for P815 targets pulsed with titrated amounts of F85–93 or F352–360 peptide. The effector population (E:T 10:1) was derived from pooled spleens of vvF-primed mice and was stimulated with RSV-infected APC. We then tested the efficiency of binding of F85–93 and F352–360 peptides to Kd and Ld, respectively, in the RMA-S stabilization assay. As Fig. 1⇑B demonstrates, F85–93 efficiently bound to and stabilized Kd over a range of peptide concentrations. In contrast, F352–360 stabilized Ld poorly when compared with a known Ld-binding CD8+ T cell epitope from murine CMV pp89 protein (17). However, F352–360 did stabilize Kd molecules despite lacking a Kd binding motif in its primary sequence but did so only at the higher peptide concentrations (10−6–10−7 M). This difference in peptide dose dependence of MHC class I binding was likewise observed at the level of target cells sensitization. F-specific CTL generated in vitro in response to infectious RSV lysed F85–93-pulsed target cells over a range of peptide concentrations (Fig. 1⇑C). F352–360-pulsed targets were also lysed by F-specific CTL, but efficient lysis was observed only at the highest peptide concentrations. The above findings suggested that the F85–93 peptide likely defined a bona fide CD8+ CTL epitope generated in response to RSV infection. The inability of RSV F-specific CTL to recognize Ld-expressing target cells as well as the poor response of the Ld motif-containing F352–360 peptide in the RMA-S stabilization assay suggested that this peptide did not define an Ld-restricted epitope in F protein. Rather, F352–360 was likely to be either a mimotope (18) of the dominant Kd-restricted F85–93 epitope or a weak subdominant Kd-restricted epitope. To assess the contribution of these two F epitopes in the CD8+ T cell response to RSV during natural infection, we harvested lung-infiltrating lymphocytes from vvF-primed mice undergoing challenge RSV infection at the peak of the response in the lungs (days 5 and 6). CD8+ T cells in the lungs responding to F85–93 or F352–360 were enumerated by ICS/IFN-γ after short term in vitro peptide stimulation. As Fig. 2⇓A shows, ∼30% of the CD8+ T cells infiltrating the lungs responded with IFN-γ production after stimulation with either peptide at the highest peptide concentration used (1 μM). 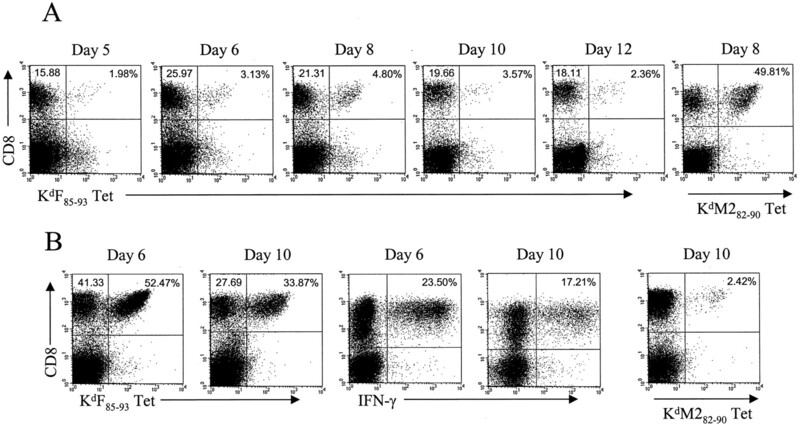 However, whereas the F85–93 peptide elicited a vigorous IFN-γ response from lung-infiltrating CD8+ T cells over a broad range of stimulating peptide concentrations, the IFN-γ response elicited by F352–360 rapidly declined as the peptide dose decreased. This finding favors the view that the F352–360 peptide defines a mimotope possibly of the dominant F85–93 epitope. Stimulation of pulmonary CD8+ T cells by peptide. A, Lung lymphocytes derived from vvF-primed, RSV-challenged mice at day 6 were stimulated with various concentrations of each peptide in ICS/IFN-γ assay. Cells were stained with anti-CD8 and then fixed and stained for cytoplasmic IFN-γ. B, F85–93 and F352–360 peptides are recognized by the same KdF85–93-specific lymphocyte population. Lung lymphocytes were stimulated with 1 μM concentrations each of F85–93, F352–360, or F85–93 + F352–360 in ICS/IFN-γ assay. The number in the upper right quadrant of each dot plot indicates the percentage of CD8+ T cells that scored positive for IFN-γ production. To more directly determine whether F352–360 stimulated an effector CD8+ T cell population in the lungs distinct from the F85–93-responsive population, we compared the IFN-γ response of lung CD8+ T cells stimulated by the individual F peptides with the IFN-γ response of lung CD8+ T cells exposed to a equimolar mixture of the two peptides at 1 μM concentration. As shown in Fig. 2⇑B, the frequency of CD8+ T cells responding to the peptide mixture did not exceed the frequency of IFN-γ-secreting cells responding to F85–93 peptide alone. This result strongly suggests that F85–93 is a real immunodominant epitope of RSV F protein and F352–360 is a mimotope that can stimulate an IFN-γ response by F85–93-specific cells only at nonphysiological concentrations. Infection of BALB/c mice with RSV results in the recruitment of H-2d-restricted CD8+ CTL responses to M2 and F viral proteins to the lungs that can be detected by ex vivo pulmonary CTL-mediated lysis (19). However, the actual magnitude of F-specific CD8+ T cell response has not been quantitated in the lungs during RSV infection. To gain a precise measure of the pulmonary CD8+ T cell response, we used tetramer technology to quantitate the numbers of CD8+ T cells responding to RSV F85–93 epitope and the previously identified immunodominant M282–90 epitope present in the RSV M2 protein during primary and challenge RSV infection. Naive (primary) and vvF-primed (secondary) mice were infected intranasally with RSV, and the frequencies of RSV-specific CD8+ T cells infiltrating the lungs in the course of infection were analyzed using Kd MHC I tetramers containing the F85–93 or the M282–90 peptide (designated as KdF85–93Tet or KdM282–90Tet, respectively). Fig. 3⇓A demonstrates that, after primary infection, the pulmonary F85–93-specific CD8+ T cell response reaches detectable levels by day 5 postinfection and peaks on day 8. When compared with M2-specific CD8+ T cell response, the magnitude of F85–93-specific CD8+ response in the lungs was relatively weak, reaching a maximal frequency of 4.8% at day 8. By contrast, the response to the dominant, Kd-restricted M2 epitope was 10-fold higher, reaching ∼50% of lung CD8+ T cells at the same time point (Fig. 3⇓A). In companion studies,5 the kinetics of M2-specific CD8+ T cell accumulation in the lungs during primary infection and the rate of decline of M2-specific CD8+ T cells at later times in infection directly paralleled the pattern observed in the response to the F85–93 epitope. These data clearly demonstrate that during natural infection the frequencies of primary CD8+ T cells responding to different RSV proteins vary significantly for the immunodominant sites within these two CD8+ T cell target proteins. Although the absolute numbers of responding CD8+ T cells vary among individual animals within an experiment and between experiments (within a 2-fold range over a series of experiments), the hierarchy of responsiveness for these two determinants was consistent with M2-specific CD8+ T cells, demonstrating a 10-fold higher frequency. Total CD8+ T cell numbers increased in the lungs at early times during primary infection (days 4 and 5) before RSV-specific CD8+ T cells were detected. This presumably reflects the nonspecific recruitment of CD8+ T cells to the lungs in response to pulmonary inflammation. We estimate that at the peak of the primary response to infection in the lungs (days 8–10) at least 50–60% of the total CD8+ T cells present in the lungs are RSV-specific with the majority of the RSV-specific CD8+ T cells (∼90%) likely representing M2-specific T cells. Visualization of F85–93-specific CD8+ T cells during the course of RSV infection. Lung cells from RSV-infected naive mice (A) or vvF-primed, and RSV-challenged mice (B) at each of the indicated days were stained with anti-CD8 and each corresponding tetramer and analyzed by flow cytometry. In case of challenge infection, the same batches of cells were cultured in the presence of F85–93 peptide (1 μM) in an ICS/IFN-γ assay. Cells are gated on a lymphocyte/lymphoblast gate. The number in the upper right quadrant of each dot plot is the percentage of CD8+ T cells that are tetramer+ or IFN-γ+; the number in the upper left quadrant represents the percentage of total CD8+ cells in the lymphocyte/lymphoblast gate. We next examined the recall (secondary) response in the lungs of the vvF-primed mice undergoing challenge RSV infection and simultaneously evaluated the primary pulmonary CD8+ T cell response to the dominant M282–90 epitope (Fig. 3⇑B). As expected, after challenge infection of F-primed mice, there was a significant expansion and the accumulation of F85–93-specific CD8+ T cells in the lungs, which peaked earlier (at day 6) and exhibited ∼10-fold higher frequency than peak primary response (∼56% of total lung CD8+ T cells vs ∼4.8% in the primary). Thus, the memory response to RSV F in the lungs was dominated by CD8+ T cells directed to F85–93 epitope. Interestingly, the strong response to the M2 epitope in the primary response was not observed during the recall response to the F protein. 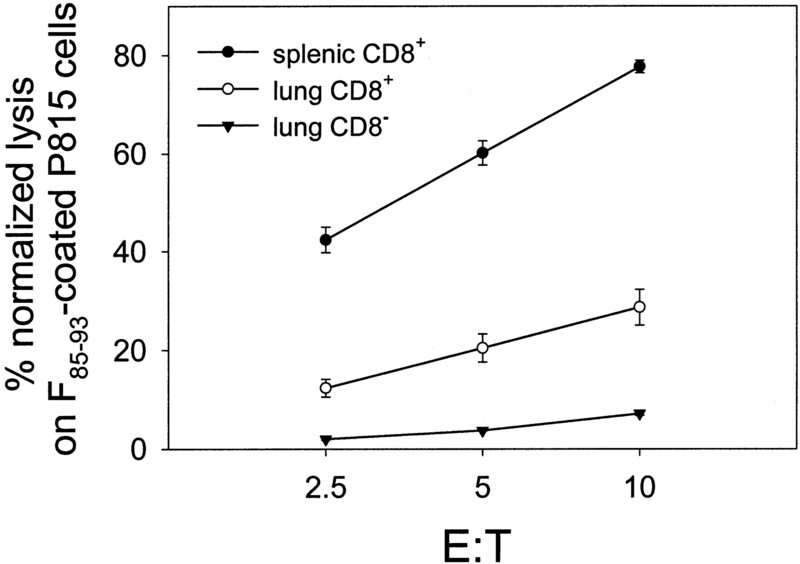 M2-specific CD8+ T cells, which accounted for ∼50% of the CD8+ T cells responding to RSV at the peak primary response (days 8–10), now accounted for <3% of the CD8+ T cells accumulating in the lungs at day 10 postinfection (Fig. 3⇑B). We did routinely observe a slight increase in the overall numbers of CD8+ T cells accumulating in the lungs during challenge infection as compared with primary infection (<50%). This increase in CD8+ T cell numbers can be accounted for by the expanded population of F-specific CD8+ T cells infiltrating the lungs during challenge infection. Although not reported here, the reduced frequency of primary M2-specific CD8+ T cells accumulating in the lungs of F-primed mice after challenge RSV infection was evident at day 8 (data not shown) and day 10 (Fig. 3⇑B) after infection. We recently reported that pulmonary RSV infection results in the defective expression of effector activity by pulmonary M2-specific CD8+ T cells.5 Therefore, it was of interest to investigate whether the functions of F-specific CD8+ T cells accumulating in the lungs after RSV infection are likewise defective in the expression of effector activity. We tested the effector activity of F-specific CD8+ T cells by examining the IFN-γ synthesis by KdF85–93Tet+CD8+ T cells and by direct ex vivo CTL assay of lung-infiltrating lymphocytes. As shown in Fig. 3⇑B and Table I⇓, at the peak of the memory response to challenge infection (day 6), ∼56% of the CD8+ T cells infiltrating the lungs stained with the KdF85–93Tet, whereas only ∼27% of the CD8+ cells produced IFN-γ in response to cognate peptide (i.e., ∼49% of the expected percentage of F85–93-specific cells based on tetramer staining). This lower than expected frequency of IFN-γ-secreting F-specific CD8+ T cells was observed whether the lung CD8+ T cells were stimulated with peptide-pulsed resident APC present in the lung cell suspension or peptide-pulsed P815 tumor cells were used to stimulate cytokine synthesis. We calculated the percentage of IFN-γ+KdF85–93Tet+ cells by dividing the fraction of IFN-γ+CD8+ T cells by the fraction of the KdF85–93Tet+CD8+ T cells because stimulation of activated effector CD8+ T cells by Ag leads to the rapid down-regulation of TCR levels and decreased efficiency of tetramer staining (Ref. 20) and data not shown). A simultaneous analysis of the expression of activation markers on lung-infiltrating cells revealed that >90% and >80% of the KdF85–93Tet+CD8+ T cells infiltrating the lungs during infection exhibited CD11ahighCD62Llow and CD25high activated phenotypes, respectively (Table I⇓). Noticeably, ∼60% of KdF85–93Tet+CD8+ T cells displayed the CD43(1B11)high phenotype, suggesting that these F-specific CD8+ T cells may not fully differentiate into terminal effectors. The 1B11 Ab is known to detect an activation-associated isoform of CD43 reported to be displayed at high levels on fully differentiated cytolytic CD8+ effector T cells (21). For the primary response, the frequency of IFN-γ-secreting KdF85–93Tet+CD8+ cells were too close to the background value to be reliably used to calculate the exact proportions of competent effectors (data not shown). In companion experiments,5 we examined the frequency of type A influenza-specific CD8+ T cells accumulating in the lungs during primary influenza infection by tetramer staining and ICS/IFN-γ assay. In this instance we observed a one to one correspondence between tetramer staining and cytokine synthesis in the frequency of Ag-specific CD8+ T cells present in the lung at the peak of infection (data not shown). Thus, the diminished frequency of IFN-γ-producing cells observed during RSV infection appears not to be a general property of CD8+ T cells accumulating in the lungs during experimental virus infection. We next investigated the direct ex vivo lytic activity of the activated, F85–93-specific CD8+ T cells infiltrating the lungs of RSV F-immune mice undergoing a challenge RSV infection in parallel with effector cells generated by in vitro stimulation of splenocytes from F-immune mice with F85–93 peptide. Viable CD8+ T cells were purified from each source and assayed with F85–93 peptide-pulsed 51Cr-labeled P815 target cells over a range of E:T ratios (Fig. 4⇓). Activated F85–93-specific CD8+ T cells generated by in vitro stimulation of F-immune precursors displayed potent in vitro cytolytic activity. In contrast, pulmonary effector CD8+ T cells exhibited significantly reduced lytic activity that was approximately one-third of the activity observed with the in vitro generated effectors when normalized to the actual numbers of F85–93-specific cells as determined by tetramer staining. Taken together, these results suggest that pulmonary RSV infection may inhibit the expression of effector activity by RSV F-specific CD8+ T cells recruited to the lungs during viral infection. Analysis of ex vivo and in vitro F85–93-specific cytolytic activity. Lung lymphocytes were obtained from the recall response at the peak (day 6) and in vitro activated splenocytes were derived from vvF-immunized mice after peptide stimulation for 6 days. CD8+ cells were then purified from each population using magnet-activated cell sorting and assayed for lysis of F85–93-pulsed P815 target cells. Specific lysis values were normalized to the number of tetramer+CD8+ cells, as determined by tetramer staining. CD8+ T cells are believed to play an important role in clearance of virus and recovery from the infection in both human and murine models. In murine RSV infection, studies have shown that prior immunization with F Ag confers protective immunity against virus infection which is mediated by both humoral and cellular responses (22, 23). In this report, we identified F85–93, a dominant Kd-restricted CTL epitope within RSV F protein in the BALB/c mouse. Using both staining with Kd tetramer containing this epitope and ICS/IFN-γ assay, we visualized the expansion of F85–93-specific CD8+ T cells in the lungs of infected mice during primary and secondary infection. In contrast to the response to the immunodominant M2 epitope (which represents ∼50% of total CD8+ T cells in the lungs responding to primary RSV infection), the F85–93-specific response represented only 4.8% of pulmonary CD8+ T cells infiltrating the lungs during primary infection. However, during challenge RSV infection of F-primed mice, the recall response to F85–93 now vastly exceeded the primary response to the M282–90 epitope in the lung compartment (∼53% vs 2.4%). The factors that potentially contribute to immunodominance hierarchy include the binding of peptides to MHC class I molecules, the efficiency of Ag processing, the precursor frequency of T cells capable of responding to a given epitope, and antigenic competition in which immune response to one determinant are suppressed by simultaneous exposure to more potent determinants (24, 25). Using a peptide binding prediction algorithm (http://bimas.dcrt.nih.gov/molbio/hla_bind/), the estimated scores for half-time of dissociation from H-2Kd molecule were 5760 for M282–90 sequence and 3456 for F85–93 sequence, respectively. However, we found that F85–93 peptide binds to Kd molecule more efficiently than M282–90 peptide in the RMA-S-Kd stabilization assay (Fig. 1⇑B). Therefore, it is unlikely that the relatively weak CD8+ T cell response to F85–93 in the lungs during primary response is due to the differences in binding affinity with MHC class I molecules between the F85–93 epitope and the immunodominant M282–90 epitope. A number of mechanisms could account for the relatively weak response to F85–93 during primary infection including lower abundance of F protein relative to M2 protein in virus infected cells, inefficient processing (fragmentation) of the epitope from the native protein, and/or inefficient transport by the TAP transporter complex. It is unlikely that the weak response to F85–93 detected during primary infection is due to the failure of specific CTL precursors to expand in vivo because on challenge infection of F-primed mice we observed a robust response to the F85–93 epitope in the infected lungs. The reduced primary response to the dominant M282–90 epitope during challenge infection (∼2.4% vs ∼50% in naive animals) likely reflects competition between the expanded population of F85–93-specific memory CTL precursors and the M2-specific CD8+ primary T cell precursors for the virus-infected APC. This phenomenon of antigenic competition between epitopes has been well documented (26, 27). In the current instance, the reduced primary M2-specific CD8+ T cell response in F-primed animals undergoing challenge infection is not at the level of processing and presentation of the F85–93 and M282–90 epitopes but most likely due to the rapid elimination of virus-infected APC by the F-specific memory effector CD8+ T cells. Because priming with the RSV F glycoprotein also leads to the production of circulating F-specific neutralizing Abs, the generation of virus-infected APC necessary for the activation of memory and primary CD8+ T cells may be limited by the effect of neutralizing Abs as well as the early generation of F-specific memory effectors. Although the mechanistic basis for the relatively weak response to the RSV F protein by CD8+ T cells remains to be determined, the ability to simultaneously detect several distinct Ag-specific T cell populations during the course of RSV infection in the lungs using tetramer staining should provide a powerful tool for the investigation of the hierarchical relationships established in vivo. We also identified a mimotope, F352–360, that is recognized by IFN-γ-secreting CD8+ T cells generated during the course of the in vivo response to the F85–93 epitope. Although this mimotope contains a well-conserved motif for H-2Ld binding, we were unable to demonstrate Ld-restricted CTL responding to infectious RSV, and the F352–360 epitope was unable to stabilize the expression of surface Ld molecules. In support of the view that F352–360 is a mimotope, this peptide exhibited a low binding affinity to H-2Kd molecules in the RMA-S stabilization assay with stabilization occurring only at high nonphysiological concentrations. This requirement for high peptide concentrations in Kd stabilization was paralleled by the result obtained with peptide stimulation of cytokine synthesis by lung-infiltrating CD8+ T cells in the ICS/IFN-γ assay. To date, there have been few H-2Kd-restricted epitopes that do not display the characteristic Kd binding motif (reviewed in Ref. 18), although there have been reports of epitopes for other class I molecules, including Kb (29) and Kk (30), the sequences of which do not conform to their corresponding described motifs. The results reported here strongly suggest that F352–360 is a mimotope and does not represent a true CD8+ T cell epitope generated during RSV infection. Using a combination of tetramer staining and functional assays, we demonstrated that F85–93-specific CD8+ T cells infiltrating the lung were defective in the expression of effector functions such as IFN-γ production and cytolytic activity. This result is consistent with our recent observation that RSV inhibits the expression of effector activity by activated M2-specific CD8+ T cells infiltrating the lungs during pulmonary RSV infection by interfering with TCR-mediated signaling.5 As demonstrated here, the suppressive effect of RSV on the development of CD8+ T cell effector activity is observed only with RSV-specific CD8+ T cells responding in the lungs to RSV infection. Taken together, these results strongly suggest that RSV has evolved a novel mechanism of suppression of the host CD8+ T cell response during natural infection, resulting in a selective defect in the terminal differentiation and/or the expression of effector activity by virus-specific CD8+ CTL at the site of infection. However, this interpretation must be tempered by the fact that difference in both the extent of virus replication in the lungs and the magnitude of the inflammatory response to infection between RSV and type A influenza could contribute to the apparent deficiency in the expression of effector activity exhibited by RSV-specific CD8+ T cells. In summary, we have used synthetic peptide screening and tetramer technology to identify and characterize the CD8+ T cell response to RSV F protein in BALB/c mice and to quantitate the magnitude of F-specific CD8+ T cell response during primary and challenge RSV infection. Although the primary CD8+ T cell response in the infected lungs to the F85–93 epitope is less than the response to the immunodominant M282–90 epitope derived from the RSV M2 protein, nonetheless the response to this F epitope is readily detectable during primary infection. The memory response to F85-93 substantially exceeds the primary response to the immunodominant M2 epitope and appears to inhibit the development of the primary response to the M282–90 epitope in the lungs. Although antigenic competition likely accounts for the relatively weak response to the M282–90 epitope during the accelerated and robust recall response to F85–93 in F-primed animals, the basis for the difference in the magnitude of the CD8+ T cell response to these two CTL epitopes in the lungs during primary RSV infection remains to be determined. We also found that like the CD8+ T cells responding to the immunodominant M282–90 epitope, F85–93-specific CD8+ T cells responding in the lungs to RSV infection exhibited a selective defect in the expression of ex vivo cytolytic activity and cytokine synthesis. A detailed characterization and analysis of CD8+ T cell epitopes and responsiveness both in experimental RSV infection and in the human should provide insight not only into the hierarchy of RSV-specific CD8+ T cell responses in vivo but also into the role of cellular immunity in controlling infection and in pathogenesis of RSV-induced pulmonary disease. ↵1 This work was supported by U.S. Public Health Service Grants AI-37293 and AI-34607. ↵2 Current address: Division of Pulmonary Medicine and Allergy, The Children’s Hospital Research Foundation, Room 4048, Children’s Hospital Medical Center, 3333 Burnet Avenue, Cincinnati, OH 45229-3039. 4 Abbreviations used in this paper: RSV, respiratory syncytial virus; F, fusion; M2, matrix 2; ICS/IFN-γ, intracellular cytokine staining for IFN-γ; vv, vaccinia virus. 5 J. Chang and T. J. Braciale. Respiratory syncytial virus infection suppresses lung CD8+ T cell effector activity and peripheral CD8+ T cell memory in the respiratory tract. Submitted for publication.